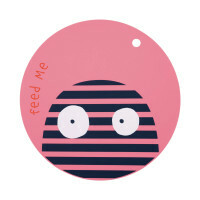 The non-slip place mat Mad Mabel lets adults and children enjoy their meals together. Its coated surface makes it easy to clean. Product information "Silicone Placemat, Little Monsters Mad Mabel"
description & equipment The non-slip place mat with wildlife designs or the little monsters Bouncing Bob and Mad Mabel appeals to adults and children alike. Its coated surface makes it easy to clean. The mat material is flexible, so it can be rolled up and stored neatly. Thanks to its attractive and cheerful design, children will happily remain seated in the future, even if the meal takes longer.